At 19 years old, Waref Hawasli ’06 was managing a band from his college dorm room. By 23, his passion for handling artists had inspired dreams of becoming music’s Jerry Maguire. By 27, he was the founding publisher of Rolling Stone Middle East magazine. Ten years and thousands of miles later, Hawasli’s passion for music and his entrepreneurial drive continue to blare. The Wayne State University alumnus recently launched Opnr — a website and app that help local musicians find gigs — with support from TechTown Detroit, the WSU-affiliated business incubator. Hawasli came to Wayne State in 2000, transferring after one year to Miami University in Oxford, Ohio. It was there, inside his tiny dorm room, that he spent three years managing his friend’s alternative rock band, The Slight Eccentric. He loved everything about being a manager, promoter and booking agent, working to help someone else achieve their musical aspirations. One of the band’s biggest claims to fame was opening for hip-hop group the Roots during a tour that brought them to campus. As The Slight Eccentric’s manager, Hawasli created a website (not yet a staple for bands in 2001), handled promotions, sent CD press kits to venues, and even personally funded studio time using tips he’d earned working the door at a local bar. He was serious about it. So serious that Hawasli even printed up contracts he’d found online. Wayne State alumnus and serial entrepreneur Waref Hawasli has been involved in promoting music since he was 19 years old. His recent endeavor, Opnr, is an app built to connect local musicians with concert organizers looking for support for their local events. After spending three years at Miami University, all the while managing the band, Hawasli came back to Detroit for personal and professional reasons. He re-enrolled in Wayne State and in 2006 earned a bachelor’s in psychology — but only after testing the waters in pre-med, political science and English. After graduation, Hawasli applied to several law schools and was accepted by a few. He had a small window of time before school began that fall. His sense of wanderlust took over and he decided to take a quick vacation to visit his brother in the United Arab Emirates (UAE). At least, he thought it would be quick. What was planned to be a two-week visit turned into nearly eight years. After making the permanent move to Dubai, Hawasli started his own publishing and creative company and launched FYI Dubai, a guide to all things happening in the city. After some success, Hawasli knew he needed a stronger brand for the company’s publishing arm. In 2008, at 26 years old, he decided to spearhead the acquisition of the Rolling Stone license. He’ll never forget the cold call he made to the magazine’s publisher, Wenner Media. 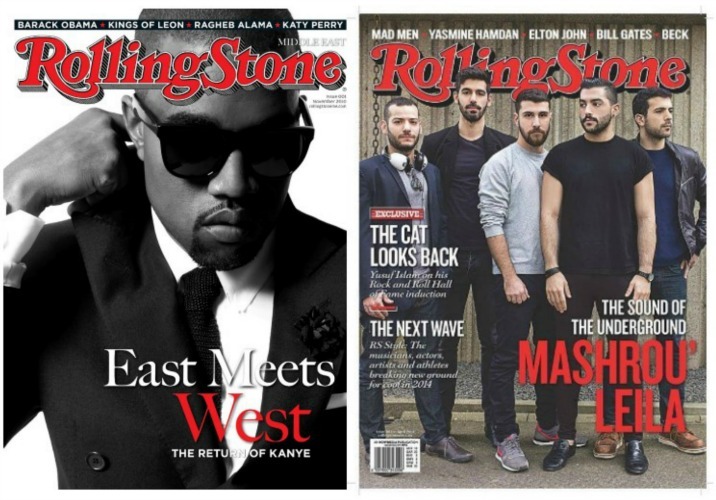 In 2008, at 26 years old, Hawasli decided to spearhead the acquisition of the Rolling Stone license. From that initial conversation, it took nearly a year and a half for Hawasli to secure the license and become CEO and publisher of Rolling Stone Middle East. November 2010 was the magazine’s first issue, and on its cover was Kanye West, who was performing in Dubai around that time. Hawasli admits that if he could go back, he would have put a Middle Eastern band on that first cover. As Hawasli continued to grow the magazine, he made it a point to distinguish the publication with exclusive coverage of Arab music, hip-hop and rock ’n’ roll. And although his goal was not to rock the boat politically, Hawasli didn’t shy away from making tough decisions on censorship, especially in a region where one must be highly sensitive to cultural conventions. Indeed, that situation arose when Hawasli’s editors approached him with a dilemma. They placed on his desk two versions of a cover that included singer Rihanna. In the photo, she wore very revealing cutoff shorts. One option was the original. The other was a censored version that his art director had created. They asked what he wanted to do. Hawasli was fined $2,000 by government officials in charge of censorship. Virgin Megastores called him and said they had to remove the issue from their shelves because of complaints. But, as the saying goes, there’s no such thing as bad publicity. It was Rolling Stone Middle East’s biggest seller to that point. Hawasli continued to develop the publication’s brand strategy and editorial team, happy with the success he helped create. Hawasli put a well-known American artist on his first cover but quickly began featuring regional bands such as Mashrou' Leila. Despite that success, Hawasli saw a huge gap in the UAE market for music lovers keen on discovering emerging bands and enjoying unique experiences. Out of that, he created the All Access concept (AAX). It consisted of an annual membership that would offer four free private concerts a year and discounted tickets to two or three other shows. Members would also get a year’s subscription to Rolling Stone delivered to their door, along with perks such as access to VIP areas at concerts, cultural experiences and meet-and-greets. AAX was only touching the surface of his bigger vision. He knew the direction the publishing industry was headed and wanted to make Rolling Stone a lifestyle brand, not just a magazine, in the Middle East. He had plans to develop a larger integrated brand vision that involved terrestrial and digital radio, clothing, a live music venue, ticketing, concert promotions, and a streaming TV channel. Hawasli devoted almost a full year to development and research. In late 2013, he pitched the full vision to Rolling Stone’s home office in New York. After six months of internal discussion, they ultimately declined Hawasli’s request. The explanation was that since Rolling Stone was not doing most of these brand extensions in the United States, they could not grant the rights to one of their licensees to roll them out elsewhere. “I was crushed,” Hawasli says. “I remember the feeling, vividly, when I received the news. I poured all my energy and passion into this larger vision and was ready to execute as soon as they gave me their blessing. At the time, I felt my vision was years ahead of where the publishing industry wanted to be. Hawasli said goodbye to Dubai with his last AAX experience. During a weeklong effort in April 2014, Hawasli’s long-term vision to fuse all aspects of popular culture — including food, art and music — came together in one place to create a cultural community around the Rolling Stone brand. Hawasli flew Guns + Butter — a popular pop-up dining experience at the time — from Detroit to Dubai, along with visual artists Jordan Nickel (known as POSE) from Chicago and Jason Williams (known as Revok) from L.A. He also booked Lebanese indie band Mashrou’ Leila to perform. Hawasli decided he had done all he wanted to do in Dubai. He had an opportunity to sell the larger media company he had created, of which Rolling Stone Middle East was the flagship. He moved back to Detroit to open a tech consulting business and real estate company. He also wanted to settle down and start a family. But the beat hasn’t stopped. In 2017, Hawasli created Fanic Music, a web-based platform to connect musicians with fans and talent buyers. A few months after launch, Hawasli saw a shift in Fanic’s usage toward finding local openers for events with confirmed headliners. 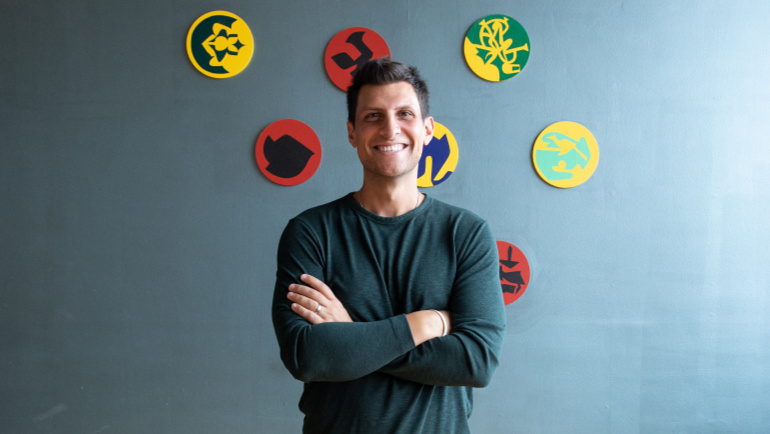 Being an adept businessperson, he saw the flaw and decided to pivot and focus primarily on what the industry was lacking: a system built to connect local musicians with local concert organizers looking for support for their local events. Opnr was born. For musicians and band managers, Opnr offers an electronic press kit generator, allowing musicians to present themselves professionally when submitting for an opportunity. A search-and-submit function navigates musicians to current opening set and other performance opportunities based on location and genre. Dan McGowan (right), managing partner of Crofoot Presents, has been an early supporter of Hawasli's Opnr app that connects promoters with musicians. On the concert organizer side, Opnr streamlines the process by allowing users to create an opportunity within the platform and then filter their search based on specific criteria such as genre or location. “They can create an opportunity and then sit back and wait for the right submissions to come in,” Hawasli says. 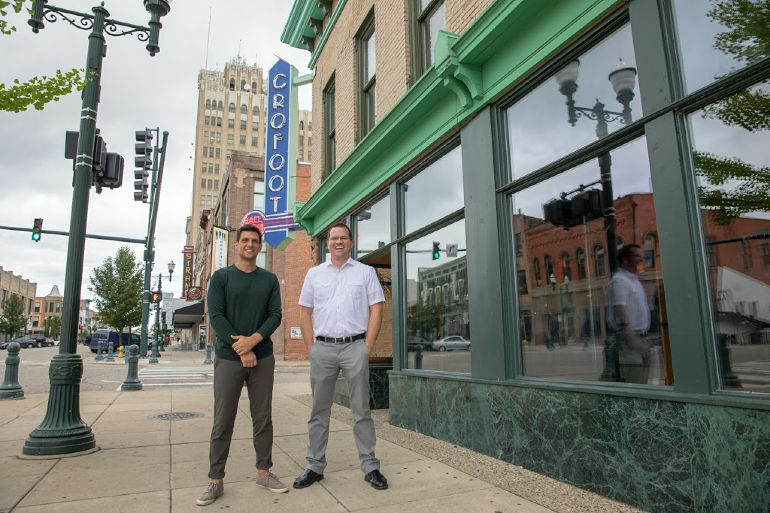 One of his biggest supporters of the concept is Dan McGowan, managing partner of Crofoot Presents, based in Pontiac, Michigan. A mutual friend connected the two. McGowan recalls the first time he and Hawasli met nearly three years ago backstage during a show at the Masonic Temple. McGowan remembers being immediately impressed. After a three-hour conversation, McGowan sensed Hawasli’s musical passion and business acumen. Since then, McGowan and his team constantly work with Hawasli on ways to perfect Opnr. Helping Hawasli further Opnr’s direction has been the TechTown Business Incubator Center. 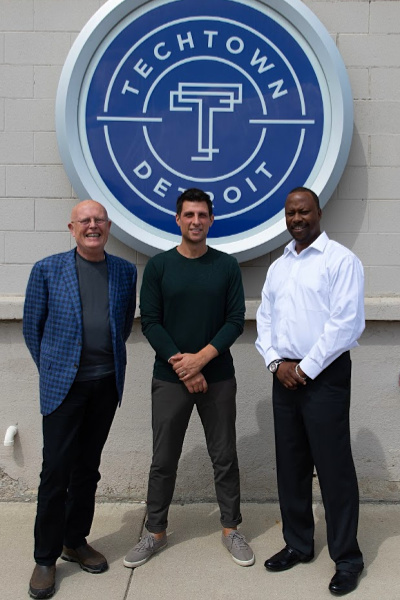 Once a week, he works directly with Francis Glorie (left), TechTown Detroit entrepreneur-in-residence, and Paul Riser Jr. (right), managing director of tech-based entrepreneurship. Also helping Hawasli further Opnr’s direction has been the TechTown Business Incubator Center, where he’s receiving up to 39 months of customized support as he grows his company. 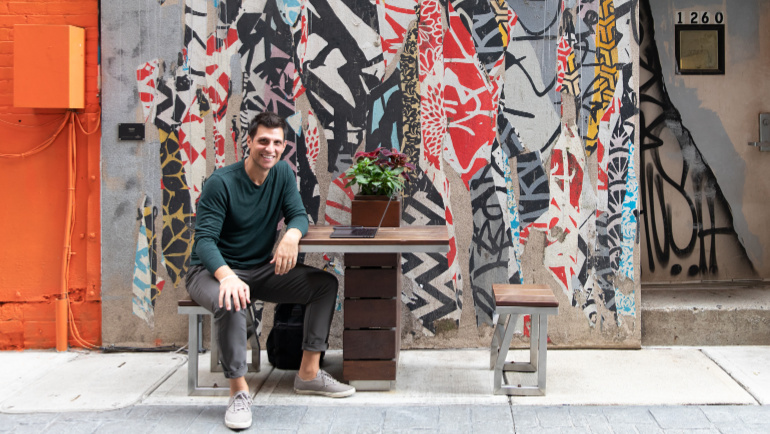 Once a week, Hawasli works directly with Francis Glorie, TechTown Detroit entrepreneur-in-residence, and Paul Riser Jr., managing director of tech-based entrepreneurship. Bonnie Fahoome, director of business programs at Design Core Detroit, connected the pair with Hawasli. The TechTown duo provide guidance on Opnr business development, partnering and funding strategies, as well as the creation of an investor pitch. This also involves connecting Hawasli with the right resources based on his company’s needs and development stage. This fall, Opnr received another boost. Michigan House, a pop-up activation space that brings the creativity and vitality of the Great Lakes state to the national stage, is collaborating with Opnr to help bring Michigan’s “experiential embassy” to South by Southwest (SXSW), the annual media, music, film and tech festival in Austin, Texas. For Hawasli, it’s the culmination of what he set out to do in that college dorm room. This story originally appeared in the fall 2018 Wayne State alumni magazine.